Przemysl, Poland, 1939. Two-year-old Renata is woken by her Mamusia in the middle of the night and bundled into the basement. The peacock quilt she is wrapped in reminds her of a story about a giant who guards a mysterious place called the Underworld. She drifts back to sleep as the sound of thunder rages around them. No one has explained to Renata what war is. She knows her Tatus, a doctor, is in Europe with the Polish Army and that her beautiful Mamusia is not allowed to work at the university anymore. But, more than anything, she notices that their frequent visitors - among them Great Aunt Zuzia and Uncle Julek with their gifts of melon and lovely clothes - have stopped coming entirely. One morning Mamusia returns home with little yellow, six-pointed stars for them to wear. Renata thinks that they will keep them safe. June, 1942. Two soldiers in grey-green uniforms burst into their apartment carrying guns. Renata, Mamusia and grandmother 'Babcia' are taken to the Ghetto and crammed into one room with other frightened families. The adults are forced to work long hours at the factory and to survive on next to no food. One day Mamusia and Babcia do not return from their shifts. Renata is five years old. Utterly alone, she is passed from place to place and survives through the willingness of ordinary people to take the most deadly risks. Her unlikely blonde hair and blue eyes and other twists of fate save her life but stories become her salvation. 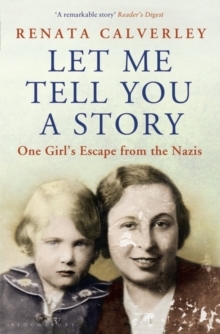 A true story of the horrors of war, Let Me Tell You a Story is a powerful and moving memoir of growing up in extraordinary times, and of the magical discovery of books.